The other day, I picked up a package of shishito peppers at a local Asian supermarket. It’s somewhat amusing, because to me, padron peppers are associated with Spain. That’s where I had them for the first time, on my first trip to the country. In fact, they were part of the first meal my sister and I enjoyed in Madrid. 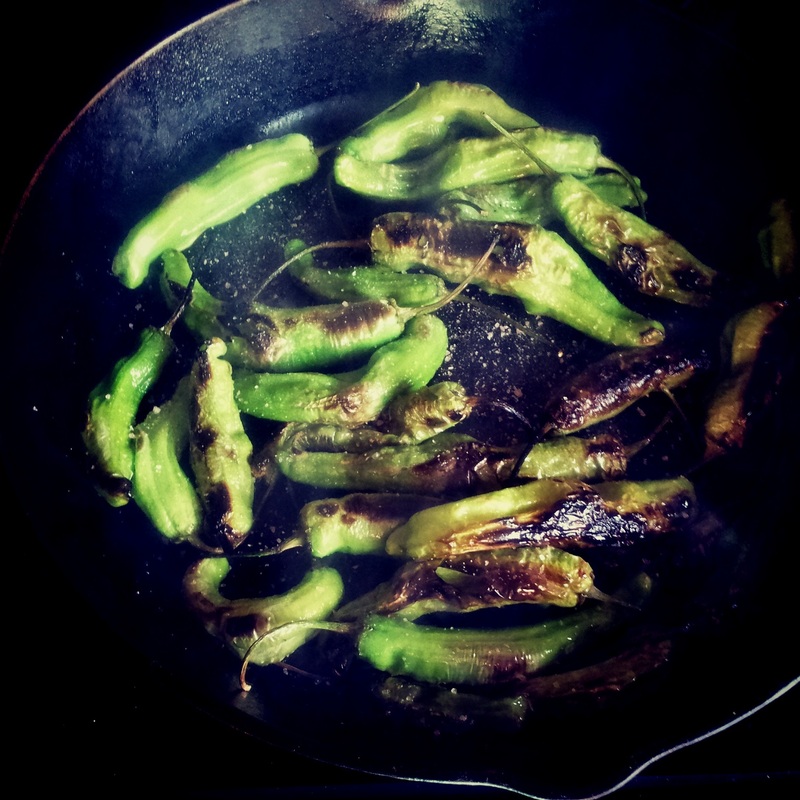 The memory has stuck, and I have often ordered these relatively small and mild green peppers at Spanish tapas restaurants. Back to the pack I bought. It has been sitting in my refrigerator for a bit too long. Every time I’d see the green peppers staring at me, I thought I should roast them or perhaps broil, but preheating the oven on these hot summer days is just unbearable. And so, today I cooked them in my trustworthy cast iron skillet. Boy, were they delicious! I could almost taste Spain as I ate one, by one, finishing up almost the entire skillet. Note: the same could be done with padron peppers. 1. Preheat cast iron skillet to high. Add oil and wait for it to start shimmering. 2. Add peppers to the skillet and cook, stirring often, until the skins begins to char and blister, about 5 minutes. My smoke alarm went off several times as the peppers were cooking and continued to sound off after the peppers were off. You might want to open your windows and turn on the exhaust fan (fair warning! ).